For anyone who missed my column on anxiety in last week's Southern Star, the text is reproduced below. To worry is human. Money, health, family problems – everyone knows what it’s like to worry about such matters, just as almost everyone gets anxious about exams and job interviews and the likes. Chronic anxiety is different; excessive and intense, such anxiety can be crippling, consuming, resulting in a severely restricted life. The distress caused by anxiety disorders is underestimated. There can be a perception that it’s “only” anxiety, that it’s not comparable to depression. In reality, the lines often blur; people often suffer from anxiety and depression simultaneously. That aside, anxiety can be every bit as debilitating as depression, and the relative inattention paid to the subject is all the more misplaced given that anxiety disorders present as the most common mental health condition. How common? One major study found 14% of people across Europe had been affected by an anxiety disorder over the previous year (continued below). Other large population-based studies found up to one-third of people will be affected at some stage of their lives. The data can vary across countries, although surveys consistently show anxiety disorders to be the most common mental health condition. Women are roughly twice as likely to suffer from anxiety disorders as men, while we also know that anxiety affects the very young. Indeed, the median age of onset is just 11, with children most likely to suffer from phobias, separation anxiety and social anxiety disorder. Early therapeutic interventions are therefore crucial to offset the risks of anxiety becoming a chronic condition. Other anxiety disorders occur later in life; among people suffering from generalised anxiety disorder (GAD), for example, the median age of onset is 31. Irish figures are not available, although thankfully awareness is increasing as to the scale of the problem. 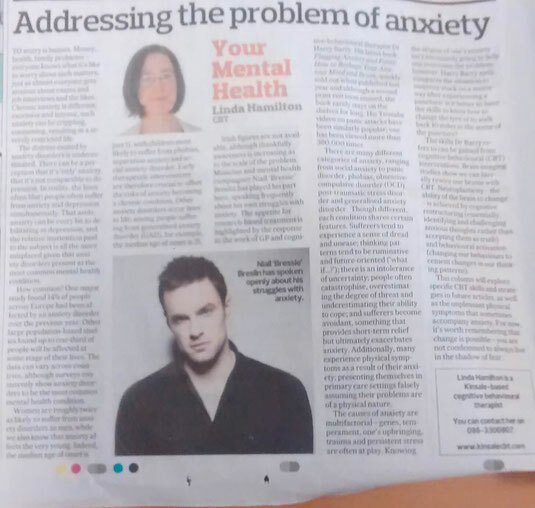 Musician and mental health campaigner Niall ‘Bressie’ Breslin has played his part here, speaking frequently about his own struggles with anxiety. The appetite for research-based treatment is highlighted by the response to the work of GP and cognitive-behavioural therapist Dr Harry Barry. His latest book, Flagging Anxiety and Panic: How to Reshape Your Anxious Mind and Brain, quickly sold out when published last year and although a second print run soon ensued, the book rarely stays on the shelves for long. His YouTube videos on panic attacks have been similarly popular; one has been viewed more than 380,000 times. There are many different categories of anxiety, ranging from social anxiety to panic disorder, phobias, obsessive-compulsive disorder (OCD), post-traumatic stress disorder and generalised anxiety disorder. Though different, each condition shares certain features. Sufferers tend to experience a sense of dread and unease; thinking patterns tend to be ruminative and future-oriented (“what if…”); there is an intolerance of uncertainty; people often catastrophise, overestimating the degree of threat and underestimating their ability to cope; and sufferers become avoidant, something that provides short-term relief but ultimately exacerbates anxiety. Additionally, many experience physical symptoms as a result of their anxiety; presenting themselves in primary care settings falsely assuming their problems are of a physical nature. The causes of anxiety are multifactorial - genes, temperament, one’s upbringing, trauma and persistent stress are often at play. Knowing the origins of one’s anxiety isn’t necessarily going to help one overcome the problem, however. Harry Barry aptly compares the situation to someone stuck on a motorway after experiencing a puncture: is it better to have the skills to know how to change the tyre or to walk back 10 miles to the scene of the puncture? The skills Dr Barry refers to can be gained from cognitive-behavioural (CBT) interventions. Brain imaging studies show we can literally rewire our brains with CBT. Neuroplasticity – the ability of the brain to change – is achieved by cognitive restructuring (essentially, identifying and challenging anxious thoughts rather than accepting them as truth) and behavioural activation (changing our behaviours to cement changes in our thinking patterns). This column will explore specific CBT skills and strategies in future articles, as well as the unpleasant physical symptoms that sometimes accompany anxiety. For now, it’s worth remembering that change is possible – you are not condemned to always live in the shadow of fear.